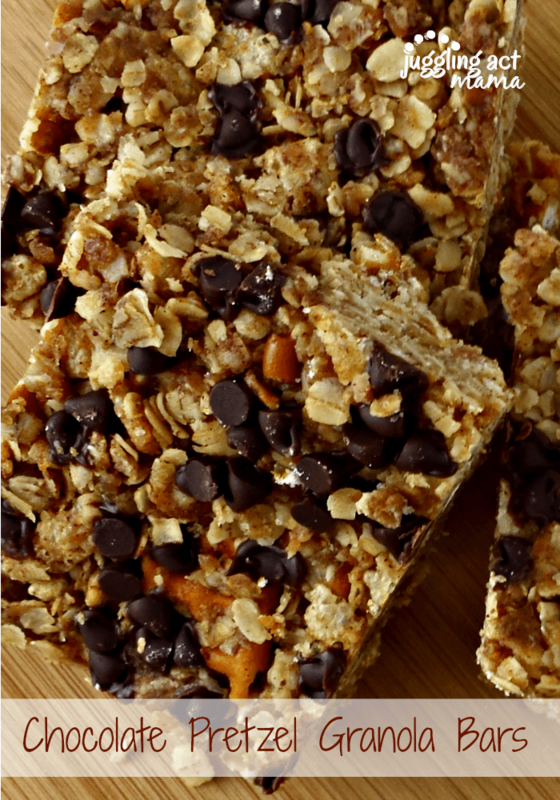 These nut free Chocolate Pretzel Granola Bars make a perfect, and safe, classroom snack! This post originally appeared on Mom’s Test Kitchen where I was a contributor. You can see the post here. 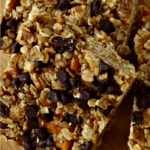 These peanut-free Chocolate Pretzel Granola bars are full of flavor and the opportunity to cook with your kids, teach math skills, compassion and empathy. Quite a granola bar, huh? Line an 8×8 baking pan with parchment paper so that it overhands on two sides. Combine the butter, brown sugar, honey and soy nut butter in a large sauce pan over medium-low heat. Bring the mixture to a rolling boil then cook for 2 minutes stirring constantly. Remove from the heat. Stir in the vanilla extract until combined. Mix in the oats, crispy cereal, milled flax seed, wheat germ, and chopped pretzels until the dry ingredients are fully incorporated into the wet. Use a piece of parchment paper to help you press the mixture evenly into the prepared pan. Sprinkle the top with the mini chocolate chips and press down again gently with the parchment paper. Refrigerate the bars for 30 minutes until cool and hard before cutting. These hold together best when served cold. Store left overs in an airtight container or resealable bags in the refrigerator. Ang, these look amazing, can’t wait to click over and get the recipe! I bet these taste so much better than the store-bought ones! Thanks for the recipe! I’m making these for my kids’ lunches!